You are here: Home / Publications / Linding Lab, BRIC & DTU [2011-present] / Identification of Hypoxia-Regulated Proteins Using MALDI-Mass Spectrometry Imaging Combined with Quantitative Proteomics. 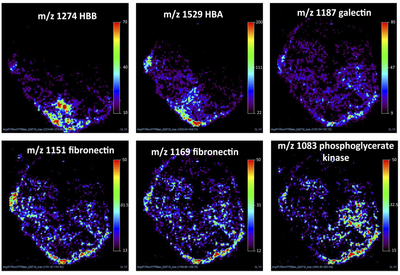 Identification of Hypoxia-Regulated Proteins Using MALDI-Mass Spectrometry Imaging Combined with Quantitative Proteomics. J Proteome Res. 2014 Apr 24. Djidja MC, Chang J, Hadjiprocopis A, Schmich F, Sinclair J, Mršnik M, Schoof EM, Barker HE, Linding R, Jørgensen C, Erler JT. Hypoxia is present in most solid tumors and is clinically correlated with increased metastasis and poor patient survival. While studies have demonstrated the role of hypoxia and hypoxia-regulated proteins in cancer progression, no attempts have been made to identify hypoxia-regulated proteins using quantitative proteomics combined with MALDI-mass spectrometry imaging (MALDI-MSI). Here we present a comprehensive hypoxic proteome study and are the first to investigate changes in situ using tumor samples. In vitro quantitative mass spectrometry analysis of the hypoxic proteome was performed on breast cancer cells using stable isotope labeling with amino acids in cell culture (SILAC). MS analyses were performed on laser-capture microdissected samples isolated from normoxic and hypoxic regions from tumors derived from the same cells used in vitro. MALDI-MSI was used in combination to investigate hypoxia-regulated protein localization within tumor sections. Here we identified more than 100 proteins, both novel and previously reported, that were associated with hypoxia. Several proteins were localized in hypoxic regions, as identified by MALDI-MSI. Visualization and data extrapolation methods for the in vitro SILAC data were also developed, and computational mapping of MALDI-MSI data to IHC results was applied for data validation. The results and limitations of the methodologies described are discussed. Pathway and network analysis of cancer genomes. Modulation of the chromatin phosphoproteome by the haspin protein kinase. KinomeXplorer: an integrated platform for kinome biology studies. CoreFlow: a computational platform for integration, analysis and modeling of complex biological data. Experimental and computational tools for analysis of signaling networks in primary cells. Computational approaches to identify functional genetic variants in cancer genomes. Global characterization of signalling networks associated with tamoxifen resistance in breast cancer. Recommendations for mass spectrometry data quality metrics for open access data (corollary to the Amsterdam principles).